I once heard a creative head of a “big two” comic publisher talk about how there are more NFL players than fully employed comic book writers. And it’s true. (Though I’ll refrain from commenting on his choice of analogy.) Comic books themselves are a tight-knit profession and hard to break into. Perhaps, even harder to become famous and support yourself as a creator,and a brief glimpse at the covers gracing any comic book shop will tell you that most of those names are male. That said, there are great female creators out there, and they’ve been there since comic books’ Golden Age during WWII. These women never disappeared from the industry. Their books are just as amazing, scary, wonderful, thrilling, titillating, funny, and insightful as anyone else’s. If anyone ever tells you that they don’t know any female creators, well, they’re just being ridiculous. 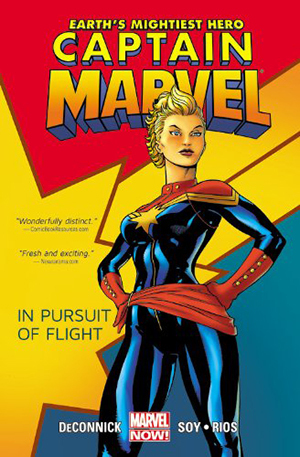 I was thrilled when Kelly Sue DeConnick was announced as the creator for this book, and it lives up to all my hopes. Created in the 1970s in the wake of the women’s lib movement, Captain Marvel, aka Carol Danvers, hasn’t always lived up to her promise. She’s gone from Avenger to nobody and back again. After changing her superhero name many times, this is the first time Carol’s taken on the moniker of her male mentor, Captain Mar-Vell. The first few issues of DeConnick’s series throws Carol into the past where she time travels and meets some of her own heroes. She fights space invaders in WWII. Then takes on the sexism of Howard Hughs himself, protesting how women weren’t allowed to be fighter pilots. Rois’ art is a beautiful accompaniment. Especially as she draws action scenes, which is good because Carol’s never far out of danger. Illustrations also by Dexter Soy. I love magical realism, and Wilson deftly works with it in this story about terrorism, love, and airplane travel. Air stars Blythe, a flight attendant who seems pretty average. Except when we find out that she has the hidden power to magically fly airplanes with symbols. 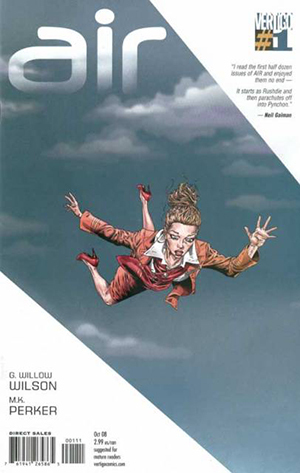 Wilson’s comic takes us through Blythe’s flight training, which includes some adventures far away, as she avoids terrorists, who want her secrets. Blythe also meets a mysterious man; one she’s not even sure she can trust, but finds herself falling in love with. Her world is definitely worth getting lost in. This outer space tale centers around the birth of Hazel, whose parents are from warring peoples. And no one is happy that they love each other, much less have a baby together. Hazel and her parents are chased by their governments and the bounty hunters hired to find them. Staples is the co-creator and artist on Saga. Her pencils bring the story to life. She draws the joy, worry, and anguish of new parents on the run. Staples creates a planet with forests full of ghosts and a world ravaged by conquerors. But my favorite is the ship, the living spaceship that’s actually a tree. I’m really looking forward to seeing what Staples does with the ship and Hazel as they grow together. Authored by Brian K. Vaughan. Humor. History. A mismatch of fictionalization and big personalities from literary favorites like Mister Darcy to Canadian prime ministers. Beaton’s writing and art is delightful and a ton of fun. Her passion for satire and love of history bleeds through every short comic, and her tales are written less like a comic series and more like what you might read in the funnies section of the newspaper. 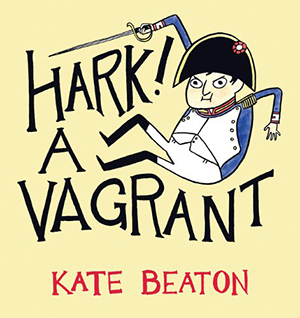 Beaton’s sketch art style fits perfectly with her humor and raw honesty. Her Wonder Woman gets calls on the infamous red phone, and refuses to fight anyone but nazis. While her Heathcliff from Wuthering Heights comes across as a crazy monster, albeit a quirky and jerky one. I’m a big fan of anyone who mixes genres and makes learning fun. Memoirs as graphic novels have been a huge trend in publishing for the past couple years, and Bechdel’s story about the mystery of her late father is one of the best. Both writer and artist, Bechdel brings you into the world of her childhood and keeps you interested from start to finish. In fact, I read the entire book in an afternoon. Bechdel’s words are smart and sharp. She’s a student both of people, in her observations and literature, making references from Joyce to Icarus. In this non-linear story, Bechdel builds the connections between herself and her father: they both share the secret that they are both gay. 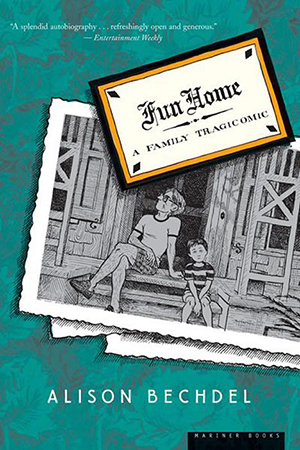 Fun Home shows both Bechdel’s grief and her love for her father. I hope this gives you a start on reading comic books by amazing creators, who also happen to be women too. From superheroes and outer space tales to memoirs and historical fiction, there’s a variety of fun out there and some great reading. Enjoy! Bio: Erica McGillivray’s comic book collection is an earthquake hazard, and she reviews comics on her site, 6’7″ & Green. She believes in reading, feminism, and tea. 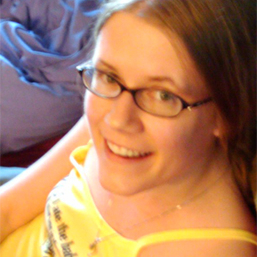 Erica’s a founder and alum of GeekGirlCon. Well, well – you learn something new every day! Thanks for introducing me to some new media, characters, and fabulous artists! They seem really nice, even though I never considered myself a comic book’s reader, I’m always looking for goor piece of material to read, in any form, and they caught my attention, so I’ll definitely look for them. Thanks for the tips, just a question: Is Alison Bechdel the inventor os The Bechdel Test or is this only a coincidence? @Vitória – She is indeed the same woman who the Bechdel Test is named after, which came out of her comic series, Dykes to Watch Out For.